There's not a lot of obvious cohesiveness to the book. Some stories are long, some are short -- there were a couple that were only one sentence each. Some of the stories are funny, some are sad, some are just perplexing. Some of the stories make the people involved look like assholes, some like drunken (other otherwise impaired) idiots, and some just like the unfortunate victims of circumstance. The stories involve big names like Jenette Kahn and small names of people you've never heard of. Some stories are ones that Talbot witnessed first-hand, some are ones he heard and later got corroboration from first-hand sources, and some he could only guess at the accuracy of. Strangely, though, the book works. I suppose it shouldn't strike me as strange, given that Talbot performed much the same stunt in Alice in Sunderland (which I reviewed back here) but the difference is that here he did in prose, and didn't have quite the same broad thematic message that he put in Sunderland. There's no "A-ha! So that's where he's been going with all this!" point for the reader. He states early on in the book that he's largely just collecting all these stories in one place for posterity more than anything else. He then proceeds, in a casual, storyteller-ish manner, to relay all these anecdotes. The content is a lot of behind-the-curtain material for comic fans of a certain age. There's not much about Golden Age creators, and there's nothing about any post-Image-launch folks. No mangaka at all, and only a few folks from outside the English and American markets. The tales are very much centered around Talbot's personal circle of peers. There's nothing wrong with that, of course; that means that the people who are familiar with Talbot will most likely be familiar with the people he's discussing. But if you're new to the comics scene, or favor certain genres or markets that tend to fall outside Talbot's purview, you're less likely to be interested in this book. And I suppose that's a lot of what I liked about it. I recognized the names of pretty much everyone he was talking about. These were stories that humanized people whose comics I've read for many years, but maybe have never met in person. These new "kids" are active on Twitter and Facebook, and I've grown up with them in a way where I'm more personally familiar with them. In some cases, I'm friends with them. But the guys (and they are mostly guys) who were doing comics professionally back in the 1970s, '80s and '90s are mostly just names on a page. Even those who've had biographies written about them tend to capture the career highlights, but without getting to the individual's character or demeanor. The ebook is currently $2.99 or free if you're an Amazon Prime member, but I believe I got my copy for free during a sale a little while back. 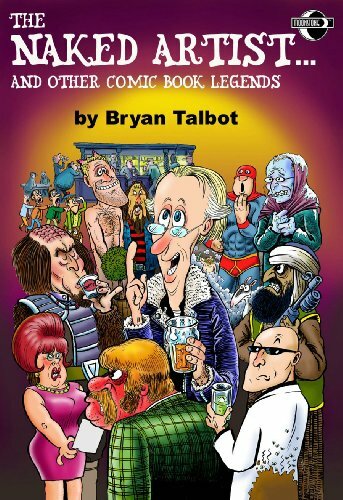 While I can't not endorse a free book by Bryan Talbot, I think the $2.99 version is a pretty darn good deal too!